During your end of the year exams, it probably feels like there aren’t enough hours in the day to get everything done. Come summer, however, you’ll have much more free time. Even if you’re working or taking classes, you will have more free time than you do during the school year. Luckily, we’ve got you covered with this summer checklist. 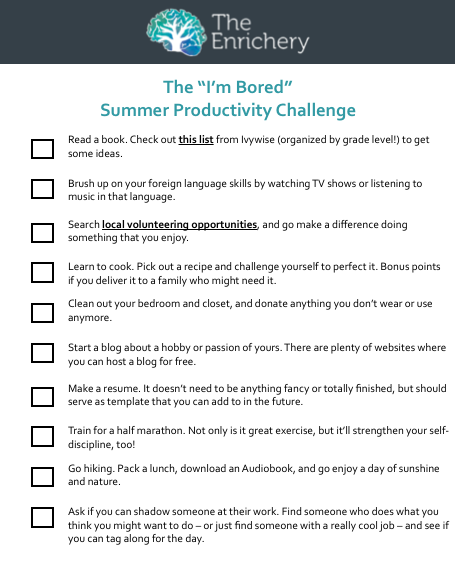 If you ever find yourself saying, “I’m bored,” this summer, pull up this sheet. Until everything on this summer checklist is completed, you have no reason to utter those words!